If you’ve gone into an auto parts store you’ve no doubt seen all those various bottles of things to add to your car. Some of the oil, some for the brakes, some for the gas, all additives that make claims, like cleaning up your injectors, boosting power and so on. Today we will dive into a small section of those, searching for the best octane booster. We’ll look into what this fuel additive does, how it can improve the performance of your car and how to pick out the best one. 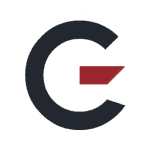 In addition, Garagechief.com will even give you a number of reviews to help you select the top choices that are on the market today. 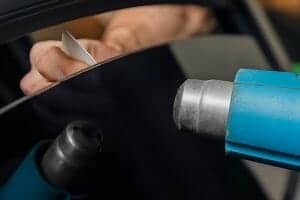 By the time you get to the end of this piece you should be nearly an expert on these additives and have no trouble selecting the best octane booster on the market today. Without further delay, let’s get right into the top products. It is always a good idea to look into various products before purchasing and octane boosters are no different. Just because some may not run you hundreds of dollars doesn’t mean that you should just blindly purchase because the bottle looks pretty. You’ll want to look through our octane booster reviews with an eye to balance cost and performance though. 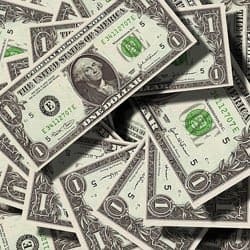 Whenever possible we will provide both the claimed boost in octane points as well as an approximate price point to help you balance how much you’ll put out for the level of performance that you can expect. We will also highlight the best booster that we found as well as the best value option to make your search a bit easier. 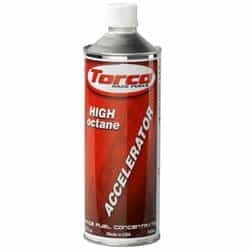 If you are just looking for the best product out there the Torco Octane Booster – Torco Accelerator is the one that you want to look for. This comes in a 32 ounce can and gives you some options as for how much of an octane boost you are looking for. The back of the can provides you a cart giving you different mixing options. 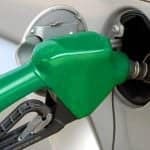 They claim that if you add the whole can to 5 gallons of gas you can look at getting a bump of 14 to your octane rating, however for a 20-gallon tank that means you would need 128 ounces for four cans. If you just use a single can for that 20-gallon tank they say you should still get a boost of 4, which is still quite impressive. For about $23 per bottle, this isn’t the cheapest product on the market, but it is very rare that the cheapest products are the best options. This additive is very clear about what it sets out to do. They don’t make any claims about cleaning your engine, it is designed to boost octane. How in the process of boosting the octane your fuel will end up burning more completely which can lead to a cleaner engine, but this is just a happy side effect. With this much power packed into this can it is no wonder that the offering from Torco tops our list as the best product on the market. 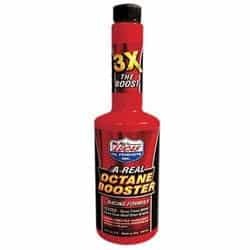 Of course, it is possible to find a lower price product that delivers great value and the world of octane boosters is no different. 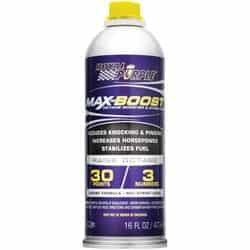 The Royal Purple Octane Booster 11757 Max-Boost Octane Booster and Stabilizer are just such a product. This 16-ounce bottle can jump your octane number a full 3 numbers (or 30 points) which is quite the impressive performance. This can lead to a boost in performance and a jump in fuel efficiency for your vehicle, but they also claim that the product has a few other tricks up its sleeve. In addition to just boosting your octane rating, this additive claims to clean fuel injectors while it is in use. They have also made a few additions to the formula to help stabilize fuel as well, so if you won’t be using something like an ATV for an extended period of time this might be the thing to add to the fuel tank to help it start up the next time that you call on it. With all of this delivered in a 16 ounce can for about $15 there is no doubt that this is our best value product. The Lucas Octane Booster 10026 makes a point of it is safe to use in any range of cars, noting that it is safe for turbos, catalytic converters, fuel injectors and carbureted engines as well. This booster comes in a 15-ounce bottle however they aren’t clear as to how much of a boost you should be looking at by adding this product to your fuel. They state that it gives you 3 times the boost as most other additives, but do not give any numbers to report. The bottle will treat up to 25 gallons of fuel, giving you the ability to use a single bottle per tank. They also mention this being not street legal, but that doesn’t make a lot of sense as this boosts the octane of the fuel in your tank, not strap a jet engine to the car you are driving. We have found that most cars will have a performance boost that you’ll be able to notice. This bottle runs you about $12, so it isn’t the most expensive option, but it is hard to clarify the performance without good numbers on the boost. The main ingredient for this booster is MMT, which we will give some more info in below in our buyer’s guide. 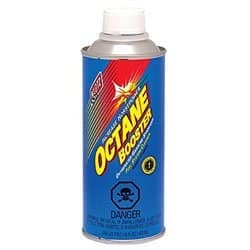 If you are looking for an octane booster with an awful lot of power in a can, look no further than the Klotz Octane Booster. This 16-ounce can claims that it can help bump up the octane rating of your fuel by 10 numbers (yes, they are claiming numbers, not points). That can take a regular octane gasoline and boost it up above premium gasoline octane levels. They recommend that you use between one and two ounces of this product per gallon of gasoline, so this can will treat between 8 and 16 gallons of fuel. Since you may very well need 2 bottles at approximately $16 a bottle this is not the cheapest solution on the planet for having a high octane number fuel, but it gives you the chance to bump up that power level quite a bit. Additionally, the additive has some of Klotz’s lubricating oil to keep all the parts of your engine that this comes in contact with nicely lubricated to provide for a smooth operating environment. One note is that this has a rather low surface tension, so pouring it can be a little bit messy, it might be for the best to look into a funnel to help get this into your tank. 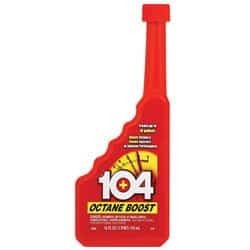 If you are looking for an octane booster that doesn’t feature MMT, look no further than the 104 Octane Boost 10406. This formula is developed to boost your fuel’s octane to give a boost of power to highly tuned engines and those that are running turbochargers. This product comes in a 16-ounce bottle and is designed to treat one gallon for each ounce, yielding a bottle that can treat up to 16 gallons. You will see that in their materials they note that this product is for off road use. That is because they have not been approved by the EPA yet to sell this as a fuel additive for street use, it doesn’t mean that it will harm your vehicle. At just about $5 this is a bargain price. From the numbers that we have found it looks like it will truly boost the octane rating by about 1 number during use, which while not as impressive as some other products we have come across is not a bad outcome when you balance cost and performance. If you are looking to save a few dollars and get a little bit of a boost this might be just the product for you. You have no doubt seen numerous bottles of STP products in just about every auto parts store in the country. 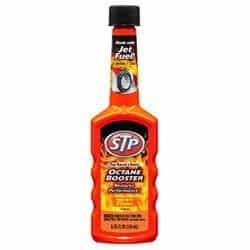 The STP Octane Booster 78574 is their offering for an octane booster. Unfortunately, they don’t make any statements as to how much this product boosts the octane level of the fuel you are adding it to. This also happens to be the smallest bottle to make our list, coming in at a mere 5.25 ounces. The product does claim that it is able to treat up to 21 gallons of fuel. They claim that this is made with jet fuel, but otherwise, there is no indication of what goes into it in order to help boost your performance. The product is made to both up your performance as well as clean your car’s fuel injection system. It also makes the other standard octane booster claims, reducing pinging and knock, restores power and the such. At just about $4 a bottle isn’t the most pricey entry, but without knowing how much it will boost the octane it is hard to do a direct comparison. Often times you will find that racing engines are tuned differently than standard car engines. 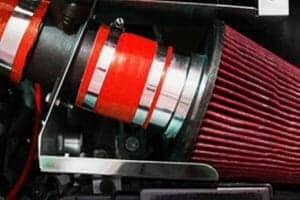 This means that you have the option of adding in things to the fuel of a race car that you wouldn’t be able to add in hopes of getting better performance in a more standard engine. We felt that we should feature a product that is designed as a race fuel octane booster. NOS 12010 Racing Formula Octane Booster – 12 oz. 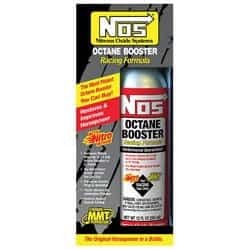 If you are running a vehicle with a highly tuned engine, like that of a racing car, you might want to check out NOS 12010 Racing Formula Octane Booster. This 12 ounce can blends MMT, Powertane and nitro methane along with some various lubricants. This mixture is designed to boost the octane rating of your fuel to three whole octane points, but that isn’t all. It is also formulated to help protect against the build up of carbon deposits as well as improving gas mileage and decreasing hesitation. One thing to note amid these claims, this is formulated for an engine that has a compression ratio of about 11.5:1 or higher (you can find it out using compression tester or scanner tools). Simply this means if you add this to a stock engine you might not see any improvement and you may actually see a decrease in performance. For a highly tuned car, this is a fantastic product to boost up the octane level and give you improved performance. While providing octane booster reviews is important to give you an idea of some of the best octane boosters on the market it is also important to have some information on what to look for in them. 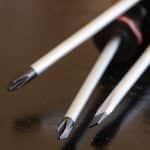 Below you will find a guide through some of the high points of what these are and what makes the best octane fuel booster. What is an Octane Booster? Simply put, an octane booster is a fuel additive. While there is a wide range of fuel additives that are each designed to accomplish things, these are formulated, as the name implies, to boost the octane in your fuel. We’ll get into exactly what that does a little later in our buyer’s guide. To fully understand what is going on we’ll also need to take a look at just what those little bottle hold and how it can affect a whole tank of gas. What Does Gasoline Octane Rating Mean? Before we get too far into figuring out how these additives work we are going to need to make sure that we have a good understanding of the octane rating of your gasoline. When you purchase gas we are all used to having three different levels with three different prices associated with them. The difference among these levels is their octane rating. This is a standardized measurement of the performance of the gasoline. The higher the number, the better the performance. To go a little more in-depth and not just leave you with ‘big number is good’, the higher octane numbers can stand more compression without firing early. As gas engines during normal operation compress a mixture of both fuel and air and then ignite them with a spark plug, having a fuel that doesn’t ignite from mere compression is a great thing. A problem that can occur in fuels with a low octane rating is known as ‘knock’ or more correctly pre-ignition detonation. If a fuel mixture is compressed too much, or if the engine is hot enough the fuel can ignite prior to the spark plug going off. This is a serious problem and can damage your engine. For the most part, even the lowest grade gas that you purchase runs fairly well in a well-maintained car, so that this shouldn’t come up as an issue. Many modern cars also have knock sensors that can change the timing should they detect some knock. 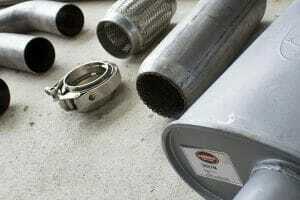 Companies have also found things to add to your gas that will help stop engine knock, they perform as octane boosters. What is the Main Ingredient in Octane Booster? The main ingredient in an octane booster will be one of these types of anti-knock agents. 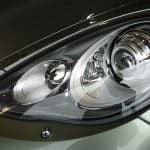 While they were developed to fight knock, people have found that the boost in engine performance can worth adding them into the mix on their own. While there is a wide range of things that can be used as the lead ingredient, we’ve distilled it down to two main additives. This stands for Methylcyclopentadienyl Manganese Tricarbonyl. Originally a substance called Tetra-Ethyl Lead was used by refineries to boost octane levels, but it is not a very environmentally friendly produce. Through testing, companies found that MMT could be a replacement and as a plus it shouldn’t mess with emission control devices that are found in many modern cars. Most quality octane boosters will end up using this as their main ingredient. This product is a cheaper alternative to MMT. It will boost the octane levels, however, it has a few issues to overcome. Many countries have banned its use in refineries. During combustion, such as in your engine, it produces iron oxide which can cause damage to your car’s systems, especially if there is a good deal of it. There are some other ones such as aromatic alcohols, which will boost octane levels but have to be added in a large enough concentration that they can be dangerous to work with. Also, some companies will use ethanol. These are generally in situations aimed at racing. As a note, since ethanol thins out your fuel mixture while boosting octane, you will want to make sure the engine you are using is tuned for ethanol if you have more than 10% of it in your fuel mixture. But Does Fuel Octane Booster Work? Now that we have had a good look at what goes into octane boosters and what octane ratings are, the big question is do these things even work? The answer is a resounding Yes! The octane boosters that are sold on the market, when added to the fuel in your tank will boost the octane rating. The second question you need to ask though is will my car see noticeable improvements. That depends on a large number of factors. The first is going to be your vehicle. If you take a beat up car from the 1950’s running a carburetor and toss in octane booster, yes the octane level will raise but you probably won’t notice much difference in performance. On the other hand, if you have a modern car with a turbocharger you will find that the octane booster does add that extra boost of noticeable performance (good blow off valve also can do that!). You will need to keep in mind what octane level your car was set up for. First, let’s look at octane ratings for gas in the US. Regular gas is generally at 87 octane, move up to Mid-grade and it ranges from 88-90 and you’ll find an octane rating of 90-94 for most Premium mixes. Now you’ll need to find the rating that your car has been tuned to use. Most cars that are sold have been designed to run on regular gas. However, if you are driving a car with a turbocharger or another premium car you might need to look at higher rating levels. 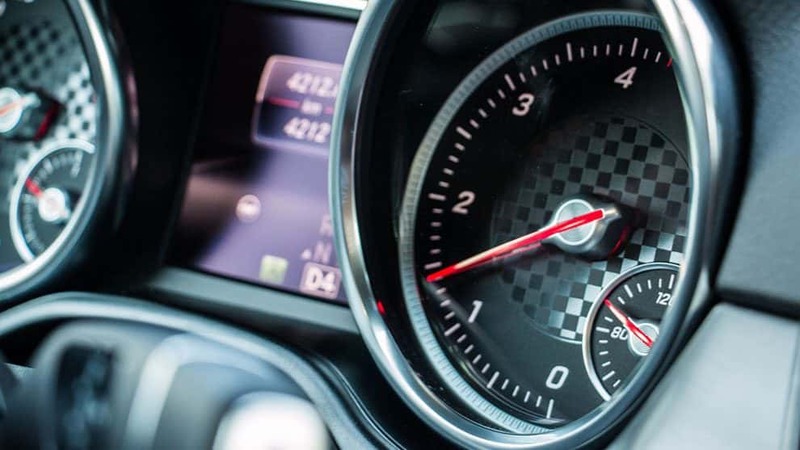 Some vehicles are designed to run best on 98-100 octane fuel, which means in the US you’ll need to be adding octane boosters even if you are buying premium fuel. How Much Does an Octane Booster Raise the Rating? This gets to be a tricky consideration. Most octane boosters will have some claimed level that they can jump up the octane rating provided on their bottle or website based on their particular mixture. In general, the best octane boosters can jump octane rating by about 3, but that is the same as the difference between regular gas and premium. Cheaper products may put their claims in points to seem larger than they are. At the end of the day, there are really two considerations when it comes to purchasing an octane booster, they are performance and cost. You will need to balance these two in order to determine if the product is right for you. As we discussed earlier octane booster will bump up the octane in your fuel. The question is how much performance will you see out of it. The biggest thing toward performance will be how much your octane rating is boosted and how much performance bump you get out of it. Be careful of how the octane boost is labeled though, some companies will put it in points so while you might think you are getting a boost of 3, you’ll end up with only a boost of 0.3. Also, you’ll need to take into account your car’s need. You’ll get the most noticeable performance if you are running a turbocharger or something similar. This doesn’t mean that you won’t find any bump if you are driving a normal car, but you’ll need to see how the fuel you are running, your car and a given octane booster perform under your driving conditions. As with most other things for your vehicle, a chunk of it will all come down to the cost involved. This is going to depend greatly on what you feel is appropriate to spend of course. 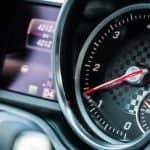 If you have a supercar that is designed to run on 97 octane and the highest octane rated fuel you can buy is 94, you might not think anything of adding in some booster at each fill up to bump up those octane points. 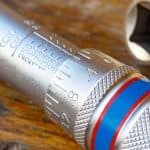 Others might only spring for it on those road trips hoping to get the best performance out of their rides. You will find that a bottle can range from only $10 or so all the way up to $50 or more in some cases. Another piece of the puzzle to factor into what you are paying is what level of fuel are you putting into your tank. If you are just buying regular fuel and throwing in an octane booster that will bump the mix from an octane rating of 87 to 89, you should at least consider if it is cheaper to merely buy the mid-grade fuel that is already in that range. Depending on fuel prices you find in your area and which level you are using this could be the cheaper method or you might find it is a better solution to buy the lower fuel grade and add the booster. To fully enjoy the benefit of these products you need to make sure that you are using them properly. That can come down to a number of different things. 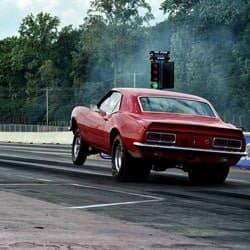 First off is that your car needs to be tuned to run on a higher octane fuel if it is set to run on standard 87 octane fuel jumping it up won’t really help you all that much. Additionally, you need to take into account how much to add in order to get the desired results. Each booster will tell you how much to add to each gallon of fuel and you’ll have to determine the right amount to treat your tank. We have come to the end of our write up and by now you should have no trouble selecting the best octane booster for your vehicle. These products do boost the octane level of fuel, though you will see plenty of reviewers claim that they don’t do anything. In order to get the best performance out of them you need to use them in a highly tuned car, perhaps one that sports a turbocharger. Pouring them into a standard car might increase performance some, but won’t magically transform them into a race car. As you went through our octane booster reviews you got a good look at 6 of the top products, but if you just want the best one that we were able to track down, look no further than the Torco Octane Booster. It will get you the boost in power that your car is looking for. Lastly, we’d love to hear from you. Do you have some experience with our picks? If so please let us know all about it in the comments section below.